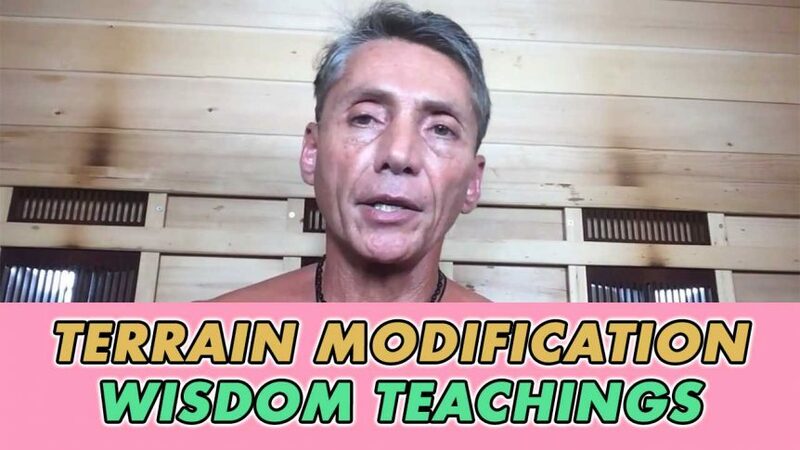 Terrain Modification Wisdom Teachings – In this Video Course we will be “Connecting The Dots” in the many areas of Health and Wellness we call “Terrain Modification”. Let’s connect a few more of the dots in the many departments of essential understandings that are very basic to some, but to others they are hard to understand. Connecting the dots is one of the ways for us to live with smarter negotiations in the future. Life is a constant school of either “Evolving” or “Suffering” (learning or not). We are going to talk about many areas of the bizarre world of parasites, and how they control many of our thoughts, actions, desires and needs. These are very powerful elusive creatures and we need to know more about them, and learn how to safely terrain modify the parasites out of the body and mind. Once you start to learn some of these ideas and concepts, try to share these ideas with your friends in order to get them on the program of living more authentically or smarter. We live in a super toxic world in many areas of essential health, and we need to see the many layers of truth so we can navigate were we may want to be or go. I made this video when I had just returned home from a three week long trip visiting and exploring many parts of Peru. So, we are going to talk a little about the multidimensional worlds and my trip, and we will connect the dots in some very important departments of Terrain Modification. My brother and son traveled with me to the beautiful, (although very crowded and noisy) city of Lima, and we went to the Highlands at 17,000 ft in the Andes to visit the Inca Indians to see how the superfood maca grows and is cultivated. My favorite part of the trip was the 7 days in the Amazon Jungle. To explore the rivers and jungle and see how the superfood Camu Camu fields grow, as well as partaking in ancient tribal “Ayahuasca” Spiritual Ceremonies deep in the jungle. I have found in my personal lifelong journey’s in the areas of “Health, Wealth, Happiness and Evolution that philosophy and having a flexible mind is one of the most important areas to understand, practice, learn and my perspectives of life have changed drastically to a more upgraded, enhanced and optimized being. Resetting, Renewing, Rebuilding and Nurturing your Body’s Internal and External Biological Terrain is a very important concept to understand, learn and practice throughout our whole life. Long Story Short: Terrain Modification (if learned and practiced) is the “The Antidote to many Sicknesses and Dysfunctions” that most of us all have or might have in the future. Terrain = The body’s Biological Terrain is possibly best described as the contextual environment of a tissue cell or group of cells. Modification = A change or alteration, usually to enhance or make something be better than it was. If you want to change something in other words, modify it, you usually need to make a modification or many to get the desired effect. Lots of things require modification, because they get older, worn out or just because they can be improved. A car or a body could need modification, in the form of snow tires etc., to be ready for the winter snow and ice or when the body is sub-optimal to get more optimal for example from “Sickness to Health”. Most computer software programs and hardware need modification at some time, or most of the time, for an “Upgrade, Enhancement or Optimization”. These exact ideas, concepts and disciplines can be also used in the human body and mind. When you think of the word modification, always think of a change to “Upgrade, Enhance or Optimize”. Terrain Modification protocols, practices and principles have over 50 departments to learn and practice for a less toxic, easier, efficient, economical or smarter way of life. Terrain Modification is the Detoxification and Rejuvenation of the the Mind and Body. In time we all start to “Become Our Own Doctors and Teachers“. This is why we created our private website EartherAcademy.com. To share personal and group practices, protocols and principles that I have learned in over 40 years of research and experimentation of the over 50 departments of “Terrain Modification”. So, let’s talk about these incredible simple but cutting edge protocols, practices and principles, and give you some examples and more clarity of these set of concepts, disciplines and understandings that primarily have to do with detoxification and rejuvenation of the body and the mind. We are going to integrate the body and mind as a complete whole-listic bio-logic-cal entity, or set of creatures. When we talk about “Terrain Modification” we are talking about many layers internally and externally, within your body and mind, and also the many layers of the outer non-seen or understood worlds. RF fields (Radio Frequencies) or any and all types of Wireless Technologies/Transmissions such as Cell Phones, Bluetooth, WiFi (or Why-Fry), Cell Phone Towers, EMF’s etc. In time we all start to accumulate toxicity and have constant biological assaults on our bodies and mind. All these factors add up and conspire against us to generate a biological “Terrain”, environment or ecology that blocks the flow of energy and allows dis-ease and dysfunction to flourish. Disease and sickness are a simple reflection of the condition of our body’s internal ecology. The ecology, or the terrain, either nourishes you to optimal health and vitality or slowly, silently and surely destroys you in a matter of time. If you have a garden, or anyone who tends a garden, you probably a very good understanding of the importance of the “Terrain of The Soil”. Growing strong and productive plants requires mineralized soil, rich in organic matter and minerals, balanced pH, correct water and adequate hydration, healthy bacteria levels and of course the sun. If a plant has its roots in soil that is properly fertilized and hydrated the plants will grow strong and beautiful. On the other hand, if we plant seeds in soil that contain artificial synthetic petrochemical, chemical fertilizers, lacking sun, moisture and water, or has been soaked with fluoride, chlorine or acid rain – the plant will fail to thrive and leaving the plant susceptible to internal and external parasites. The same concept of biological terrain modification can be applied to our own health and wellness or propensity for disease. Our bodies 100 trillion cells are no different than the seeds we sow in our gardens. To maintain good health and vitality of the cells we need to keep the terrain modified and balanced correctly. Just like the gardener, we are concerned with pH balance, correct mineral supply and hydration, reducing toxic exposure to chemicals, RF and magnetic fields, parasites and healthy gut or intestinal bacteria. How can we think about our body’s biological terrain or ecosystem? Given that the human body is 70-80% our biological terrain it is basically the fluid environment that surrounds the trillions of cells in our bodies. An overly acidic terrain is extremely attractive for a host of creatures such as viruses, fungus, yeast, candida, molds, pathogenic microbes and a host of other parasites. So, when the body’s terrain is sub-optimal with a toxic weak environment, this allows many parasitic creatures/organisms to flourish and attack our immune systems and steal the nourishment from our foods and bodies. Pathogenic micro-organisms such as viruses, parasites, bacteria, mold and yeast all grow more easily in an acidic, oxygen deprived terrain environment that is overly acidic, toxic and dehydrated. The acidification and toxicity of the body’s internal terrain is directly related to a plethora of many health dysfunctions ranging from being overweight, fatigue, headaches, mental and emotional confusion, obesity in children and adults, cognitive disturbances, many forms of depression, premature aging and worse yet – heart disease, and even the “BIG – C (cancer)”. Spend a few hours a day and watch a variety of the videos we share at here on Earther Academy especially in the areas of Skin Cleaning, Detoxification and Rejuvenation, Liquids of Vitality, Parasites, Interdimensional Awareness and Fasting to start your research.